In the Carlisle Indian School records, we find someone listed as Sleep Long Time, a Chief, listed among the students. I was interested to see what I could find about this man. The picture below was taken between 1910 and 1915 of Long Time Sleep, which could be the same person, although the name is slightly different. Sometimes the person indexing the Carlisle records had difficulty in determining the order of English Native names, such as Long Time Sleep or Sleep Long time. Perhaps some additional information would shed light on this situation. In an article published in the New York Times on May 4, 1913, Long Time Sleep is referred to as a wealthy Indian of the Glacier National Park Reservation. This is the first time I’ve ever heard of a wealthy Indian. It says he is part of a motorists club from Minneapolis and will enter his car in a national reliability run covering about 1200 miles. They mention that Long Time Sleep is the most fluent “talker” in the universal sign language of the American Indians, is of the Piegan Nation and dos not speak a word of English. Wikipedia gives a slightly different story. 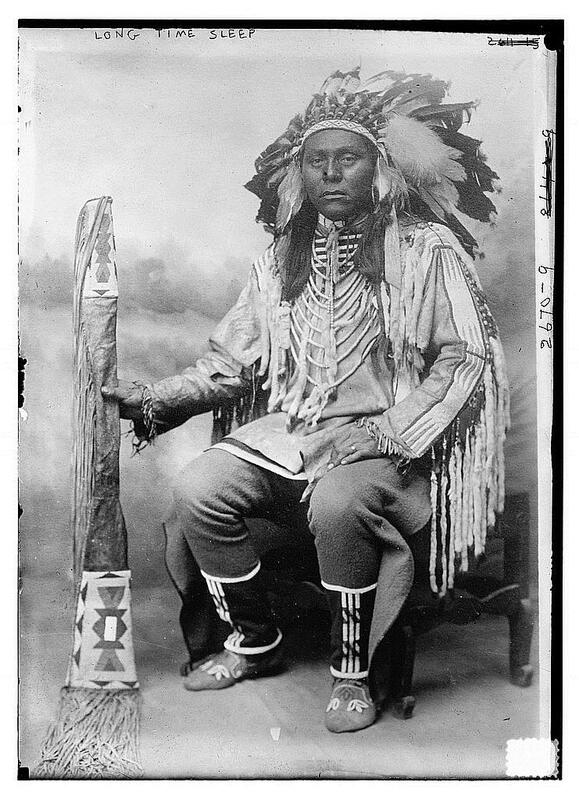 Wiki says that Long Time Sleep was named Nicholas Anthony Lassa from the Flathead Indian Reservation in Montana and a member of the Blackfoot tribe. The man above may not be the same Long Time Sleep, in fact, probably isn’t. A man who had studied at Carlisle would speak English, to begin with. Secondly, the Nick Lassa from Carlisle was supposedly given his name by his football teammates because he was so difficult to wake up. Third, a man playing football professionally in 1922 after previously attending Carlisle would probably not have been listed in 1913 as a wealthy Indian. It seems that we are about a generation offset. Nick not only played football, he was also a professional wrestler, once wrestling a bear at halftime at one of the football games. He use his wrestling earnings to take the entire team. The Oorang Indians, out drinking all night. After the professional team folder in 1923, just a year after being formed, Nick stayed near LaRue, Ohio for some years before leaving the area, giving up drinking, raising a family and becoming a respected member of his community. It looks like Nick attended the Haskell Indian Nations University in addition to Carlisle. Haskell is located in Lawrence, Kansas. The article doesn’t say if Nick Lassa, aka Long Time Sleep, was ever an Indian Chief. This entry was posted in Blackfoot, Piegan. Bookmark the permalink. So fun to read this. My dad was named Haskell and I always heard he was named after an Indian Tribe. Guess he was! Plus my grandmother on my mom’s side was a Carlisle. My great grandma Marian Pichette’s maiden name is Lassa. Her dad was Nick Lassa which is my great great grandpa, I’m just learning about him and I would say this article helped me learn more about my family history. I have been searching for a friend. He was in the Marines in 1970s in North Carolina. He was a good friend. He told me he was Black Foot and from Up state New York on a reservation. His name was Stephen K. McKellroy. If you could help me find him, I would appreciate it.